I hate linen. A lot. You can usually see through it, it wrinkles when you look at it, and generally I just think it's unattractive. 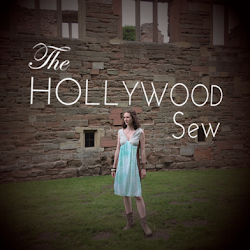 But the boyfriend handed me one panel of charcoal gray linen curtains and told me to add it to my stash, that maybe I could make a dress from it. Not happening. 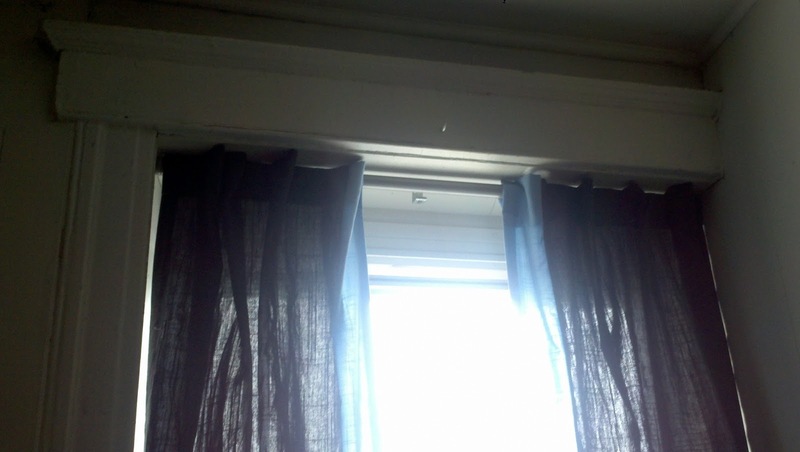 But since I did have one curtain panel, why not use it? 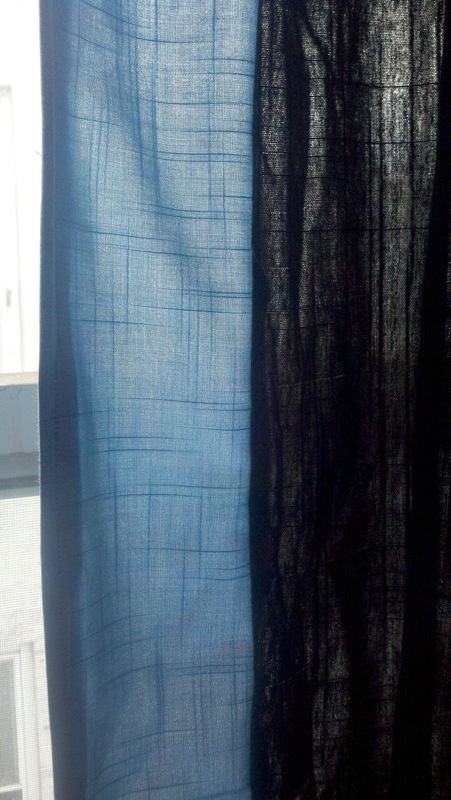 I cut it down the middle to create two panels, then paid entirely too much for some blue linen to mix with it. 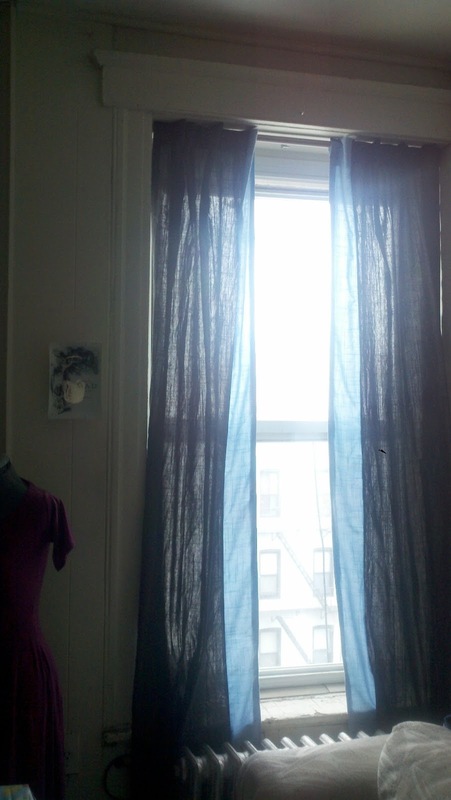 I tend to like ruffles on my curtains, but I'm pretty sure linen won't drape well enough for that. So I did an easy fix and went for the mod look. I just added some color and length to the sides. Super easy! In all, it took me an hour, which isn't bad. 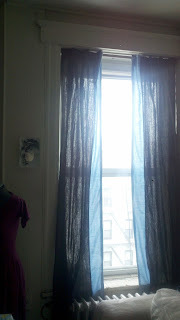 I have tons of blue linen left over (and just a bit of gray since I cut off some of the length so that it wouldn't permanently rest against the radiator) so I'm thinking of making a matching lampshade and maybe some pillows for the room. It also works perfectly because the room is designated as winter, as all the rooms in my apartment have seasons assigned to them. And the gray and blue is just the perfect color as well. Or perhaps the linen material is perfect because it's not too dark. 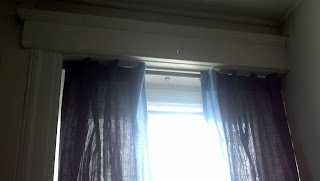 I tried taking a picture of the room with the curtains closed - it does darken the room, but the linen is so thin that the light continues to stream in. Generally I love them and I can't wait to finish all the other home accessories for the room!